This table is the perfect size in my small living room. I love that it comes with an electric plug which I use to plug in my phone. The small drawer in front is the perfect size for a finger nail file, or you could store your tv remotes. This table supplied both my needs small width and USB. I needed a small width table to sit between wall of sofa. I can now charge my phone and tablet. And received great comments on table. The only issue, is the 2 USB outlets do not work. I love the table because it attractive and I like not having extention cords and sun cords all over the floor. Nice looking and useful table fitting nicely at end of sofa. More attention to manufacturing detail should address, 1) two of the four threaded ferules accepting the machine screws for attaching legs would not accept the provided screws due to stripping and being off center, requiring drilling holes and using #8 x 1" screws, 2) drawer front panel was not glued to sliding drawer section requiring use of wood glue for attachment. While table will be of use for intended purpose be prepared for possible repair(s). I was looking for USB outlet on some type of furniture. This table was excellent and can place next to sofa. The outlets made it easy for me to recharge my phone and tablet. The only disappointment was the two USB outlets did not work. Because I was asked to. Not that its any of your biz. 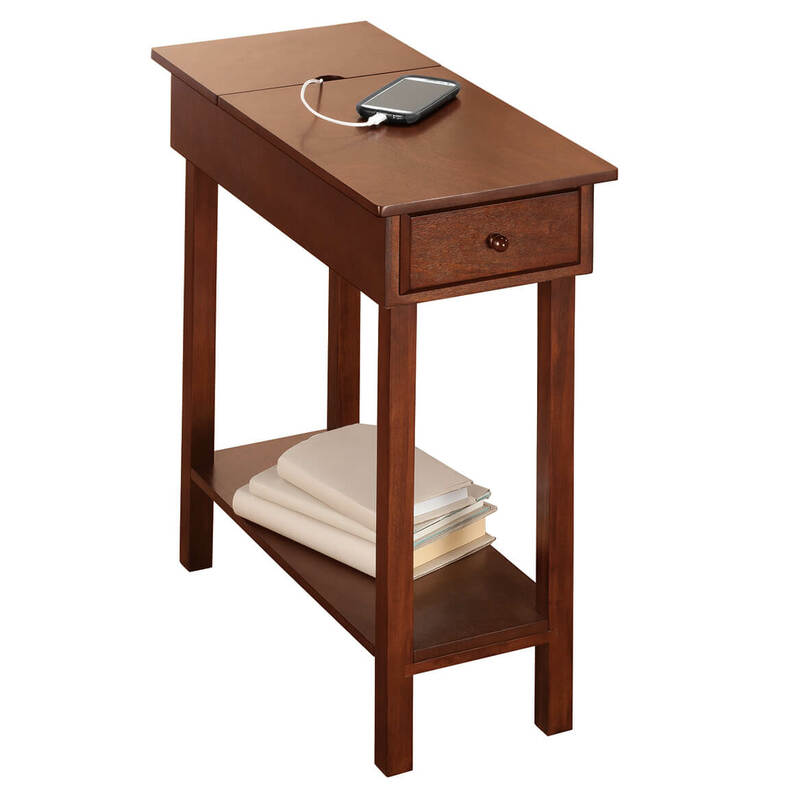 It's convenient and useful side table for computer and other electronics. i have a tiny space this table is perfect for. I love this table next to my chair and it is slim. So it works great in small spaces and it has you USB ports and outlets built in. 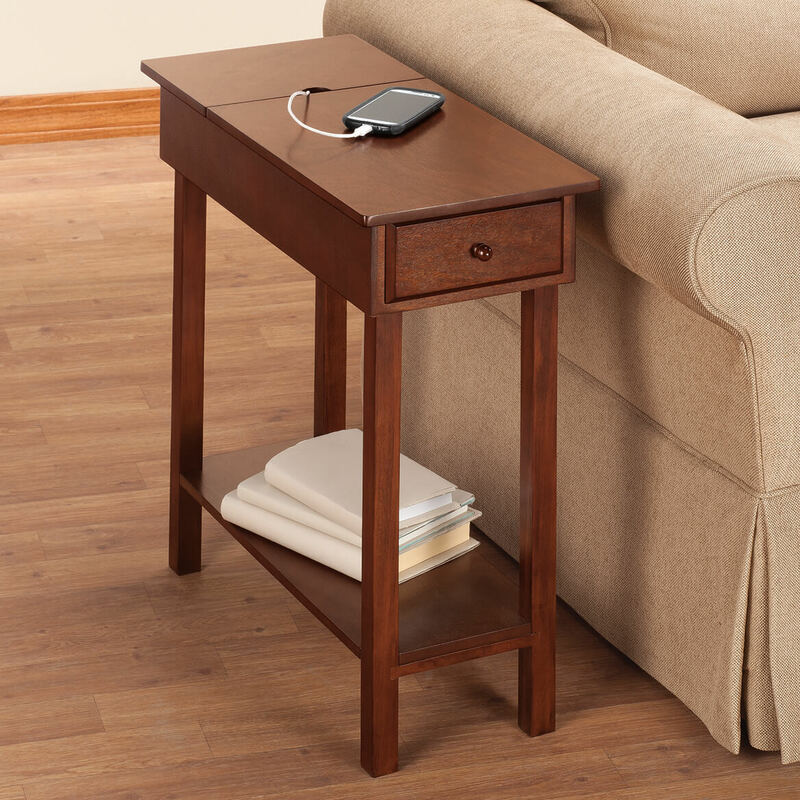 Very nice quality end table. Like its smaller size for a small space. 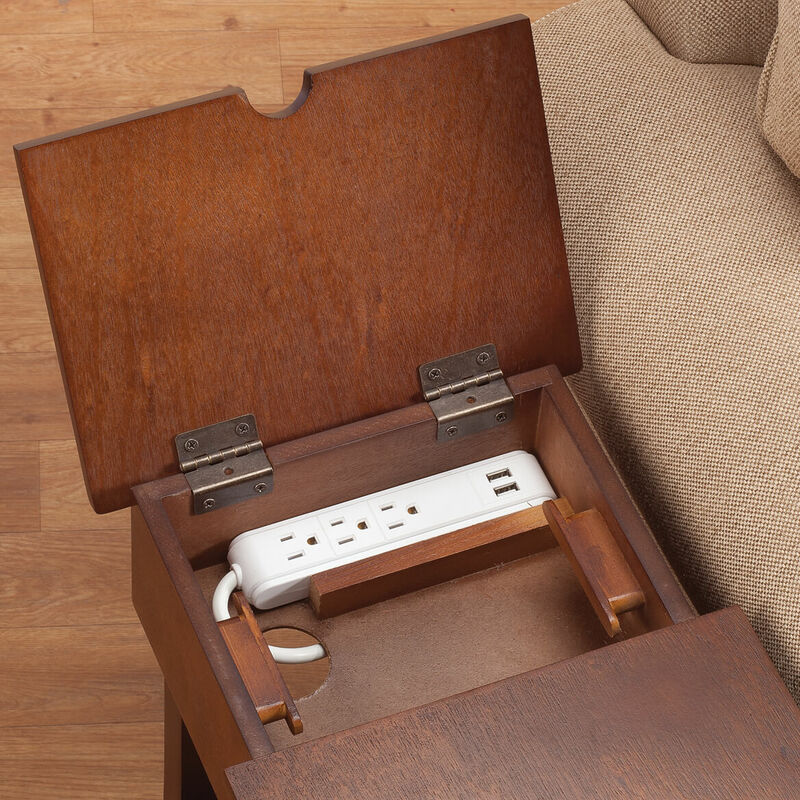 The built-in power strip and USB ports will end all the cords clutter I have at the end of my couch. It will be perfect! fits our needs between our two recliners in our RV. I thought it would be a nice addition next to my husband recliner & the phone can be plugged into the table. Has USB ports and takes up very little space. Chose for small size and USB ports! Needed a stand by my chair and it is just right. We needed a narrow table by our bed and I liked the fact that it had a power strip in it. I have a similar style in my family room but I wanted one for the den which was not fully enclosed my first one. This looked perfect. Need in a narrow space. Also the USB charger will be great to have when grandchildren come. It says there is a drawer...but the picture does not show a drawer. I cannot even consider ordering if it does not have what it says. Anyone? Which is it? This picture shows a drawer, but when it is enlarged and put in as item #358129 and the description states bottom shelf for extra storage, plus a convenient drawer. 24” L x 11” W x 24” H design fits in small spaces that picture does not show a drawer. Which is it? BEST ANSWER: Thank you for your question. The table does not include the drawer. We hope this information will be of help to you. what color does it come in ? BEST ANSWER: Thank you for your question. This table comes in a light pine color. We hope this information will be of help to you. Has the issue with the faulty USB ports been resolved with the vendor? Two of the four reviews state this problem. Not as far as I know. The USB ports get hot and don't always charge. I only use the plugs with the adaptor. BEST ANSWER: No. You have to put it together. I have not used the table yet. No. But it’s super easy to put together!